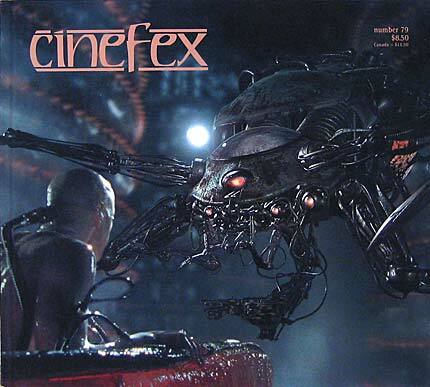 Offering up a mix of stylish martial arts and cerebral science fiction, The Matrix - the brainchild of writer-directors Larry and Andy Wachowski - offered a singular vision of a world where reality is nothing more than an elaborate computer construct. Visual effects were achieved principally by Manex Visual Effects and DFilm Services, with assists from other firms in both the United States and Australia. With source material plumbed from the popular sixties television series, director Barry Sonnenfeld's Wild Wild West offered up a comic saga of Old West derring-do pitted against outrageous villainy and bizarre gadgetry. Makeup effects by Rick Baker, physical gags by Michael Lantieri and digital creations by Industrial Light & Magic and Cinesite enlivened the proceedings. In The Haunting, based on the novel by Shirley Jackson, the malevolent spirit of a killer manifests itself in a gothic mansion, turning imagined threats into nightmarish reality for the unwitting subjects of a psychological study. Director Jan De Bont sought the talents of effects maestro Phil Tippett and production designer Eugenio Zanetti, among others, to inject new life into the eerie tale. Mako sharks, armed with enhanced intellects and super-predatory instincts - the result of genetic experimentation on board an aquatic research station - turn on their captors in the Renny Harlin thriller, Deep Blue Sea. Animatronics innovator Walt Conti teamed with visual effects supervisor Jeffrey A. Okun and a host of digital effects facilities to complete the project.